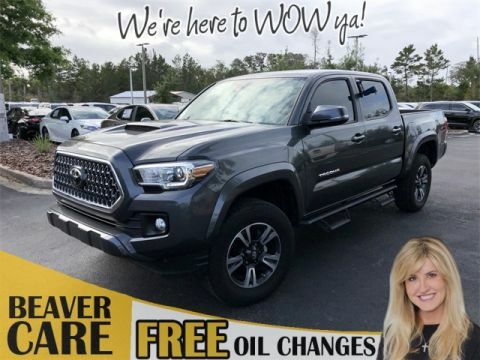 If you’re looking for a compact pickup at a low price, a used Toyota Tacoma from Beaver Toyota St. Augustine is worth a close look. Whether you’re heading off-road in Palm Coast or sticking to the streets of St. Augustine, the Tacoma can deliver. Many used Tacomas feature four-wheel drive and comfortable seating, so take a look at our used truck inventory today! 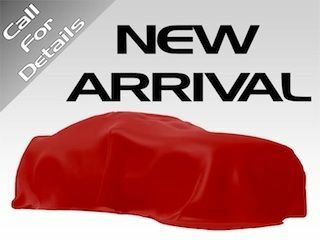 PRISTINE CONDITION, NONSmoker, Local Trade, Fresh Oil Change, Passed Dealership Inspection, Freshly Detailed, EXCELLENT CONDITION, 4X4 4X4 4X4 CUSTOM WHEELS ,ABSOLUTELY NEW ,HAS ALL THE EYES ,LOOKING FOR AN INEXPENSIVE 4X4 ,WE HAVE IT ,AND WE MAKE SURE IS THE BEST SERVICED USED CAR IN AMERICA FOR YOU AND YOUR FAMILY. Indigo Ink Pearl 2008 Toyota Tacoma 4WD 4.0L V6 SMPI DOHC Awards: * 2008 KBB.com Brand Image Awards Indigo Ink Pearl 2008 Beaver Toyota Tacoma is a 4D Double Cab 4WD . This Florida Truck has a 4.0L V6 SMPI DOHC engine. Call right now and schedule a test drive. 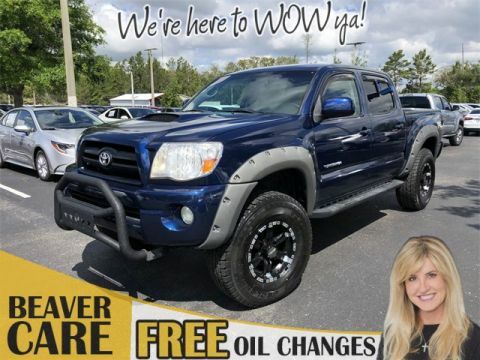 Ask for stock number 038379P, the Florida 2008 Beaver Toyota Tacoma . Shop Us Online at www.beavertoyotastaugustine.com. Serving Jacksonville, Palm Coast, Daytona, Gainesville and St Augustine. Beaver Toyota St Augustine on 2995 US Hwy 1 South in St Augustine. Clean CARFAX. NO ACCIDENTS ON CARFAX REPORT, NONSmoker, MUST SEE!, Fresh Oil Change, Passed Dealership Inspection, Freshly Detailed, EXCELLENT CONDITION. Silver Streak Mica 2005 Toyota Tacoma 4WD 4.0L V6 SMPI DOHC Silver Streak Mica 2005 Beaver Toyota Tacoma is a 4D Double Cab 4WD . This Florida Truck has a 4.0L V6 SMPI DOHC engine. Call right now and schedule a test drive. 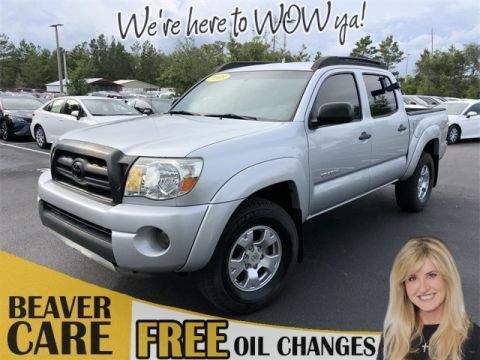 Ask for stock number D509731A, the Florida 2005 Beaver Toyota Tacoma . Shop Us Online at www.beavertoyotastaugustine.com. Serving Jacksonville, Palm Coast, Daytona, Gainesville and St Augustine. Beaver Toyota St Augustine on 2995 US Hwy 1 South in St Augustine. CARFAX One-Owner. Certified. PRISTINE CONDITION, Bluetooth Handsfree, NO ACCIDENTS ON CARFAX REPORT, TOYOTA CERTIFIED*7 YEAR/100K MILE WARRANTY*$0 DEDUCTIBLE*BUY WITH PEACE OF MIND, Rear View Camera, One Owner, NONSmoker, Local Trade, MUST SEE!, Fresh Oil Change, Passed 160 Point Toyota Certified Inspection, Passed Dealership Inspection, Freshly Detailed, MINT CONDITION, EXCELLENT CONDITION, LONG BED HARD TO FIND ,CERTIFIED THE ONLY WAY TO BUY A USED CAR ,THE TOP CERTIFIED DEALERSHIP IN THE COUNTRY IS HEAR TO WOW YOU!!. Priced below KBB Fair Purchase Price! 2017 Toyota Tacoma SR5 RWD V6 Toyota Certified Used Vehicles Details: * Transferable Warranty * Limited Comprehensive Warranty: 12 Month/12,000 Mile (whichever comes first) from certified purchase date. Roadside Assistance for 1 Year * 160 Point Inspection * Warranty Deductible: $50 * Vehicle History * Powertrain Limited Warranty: 84 Month/100,000 Mile (whichever comes first) from original in-service date * Roadside Assistance Awards: * 2017 KBB.com Best Resale Value Awards * 2017 KBB.com 10 Most Awarded Brands 2017 Beaver Toyota Tacoma SR5 is a 4D Double Cab RWD . This Florida Truck has a V6 engine. Call right now and schedule a test drive. Ask for stock number 003130, the Florida 2017 Beaver Toyota Tacoma . Shop Us Online at www.beavertoyotastaugustine.com. Serving Jacksonville, Palm Coast, Daytona, Gainesville and St Augustine. Beaver Toyota St Augustine on 2995 US Hwy 1 South in St Augustine. CARFAX One-Owner. Clean CARFAX. Certified. ABS brakes, Air Conditioning, Compass, Electronic Stability Control, Illuminated entry, Low tire pressure warning, Remote keyless entry, Traction control. Priced below KBB Fair Purchase Price! Inferno 2016 Toyota Tacoma TRD Sport RWD V6 Toyota Certified Used Vehicles Details: * Transferable Warranty * 160 Point Inspection * Vehicle History * Warranty Deductible: $50 * Roadside Assistance * Limited Comprehensive Warranty: 12 Month/12,000 Mile (whichever comes first) from certified purchase date. Roadside Assistance for 1 Year * Powertrain Limited Warranty: 84 Month/100,000 Mile (whichever comes first) from original in-service date Awards: * 2016 KBB.com Best Buy Awards Finalist * 2016 KBB.com Best Resale Value Awards Inferno 2016 Beaver Toyota Tacoma TRD Sport is a 4D Double Cab RWD . This Florida Truck has a V6 engine. Call right now and schedule a test drive. Ask for stock number 011841, the Florida 2016 Beaver Toyota Tacoma . Shop Us Online at www.beavertoyotastaugustine.com. Serving Jacksonville, Palm Coast, Daytona, Gainesville and St Augustine. Beaver Toyota St Augustine on 2995 US Hwy 1 South in St Augustine. CARFAX One-Owner. Clean CARFAX. Certified. PRISTINE CONDITION, GPS / NAVI / NAVIGATION, NO ACCIDENTS ON CARFAX REPORT, TOYOTA CERTIFIED*7 YEAR/100K MILE WARRANTY*$0 DEDUCTIBLE*BUY WITH PEACE OF MIND, Rear View Camera, One Owner, NONSmoker, Local Trade, Towing Package, Bought here NEW!, MUST SEE!, New Tires, Fresh Oil Change, Passed 160 Point Toyota Certified Inspection, Passed Dealership Inspection, Freshly Detailed, MINT CONDITION, EXCELLENT CONDITION. Black 2017 Toyota Tacoma SR5 4WD V6 Toyota Certified Used Vehicles Details: * Roadside Assistance * Powertrain Limited Warranty: 84 Month/100,000 Mile (whichever comes first) from original in-service date * 160 Point Inspection * Vehicle History * Limited Comprehensive Warranty: 12 Month/12,000 Mile (whichever comes first) from certified purchase date. 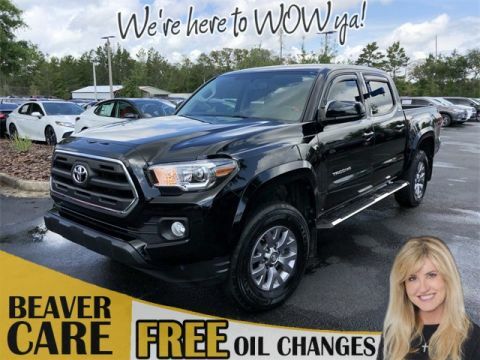 Roadside Assistance for 1 Year * Warranty Deductible: $50 * Transferable Warranty Awards: * 2017 KBB.com Best Resale Value Awards * 2017 KBB.com 10 Most Awarded Brands Black 2017 Beaver Toyota Tacoma SR5 is a 4D Double Cab 4WD . This Florida Truck has a V6 engine. Call right now and schedule a test drive. Ask for stock number M233610A, the Florida 2017 Beaver Toyota Tacoma . Shop Us Online at www.beavertoyotastaugustine.com. Serving Jacksonville, Palm Coast, Daytona, Gainesville and St Augustine. Beaver Toyota St Augustine on 2995 US Hwy 1 South in St Augustine. CARFAX One-Owner. Clean CARFAX. Fresh Oil Change, Passed 160 Point Toyota Certified Inspection, Passed Dealership Inspection, Freshly Detailed, MINT CONDITION, EXCELLENT CONDITION, THIS IS AMUST SEE TRUCK ,CUSTOM WHEELS ALL THE LOOKS ,DRESSED TO KILL ,ABSOLUTELY GORGEOUS TRUCK ,ANOTHER HANDPICKED TRADE FROM BEAVER TOYOTA THE LEADER IN CERTIFIED TOYOTAS IN THE MARKET,DONT MIS THIS TRUCK ,WHAT A BEAUTY!!. Gray 2016 Toyota Tacoma SR5 4WD V6 Awards: * 2016 KBB.com Best Buy Awards Finalist * 2016 KBB.com Best Resale Value Awards Gray 2016 Beaver Toyota Tacoma SR5 is a 4D Double Cab 4WD . This Florida Truck has a V6 engine. Call right now and schedule a test drive. Ask for stock number X813720A, the Florida 2016 Beaver Toyota Tacoma . Shop Us Online at www.beavertoyotastaugustine.com. Serving Jacksonville, Palm Coast, Daytona, Gainesville and St Augustine. Beaver Toyota St Augustine on 2995 US Hwy 1 South in St Augustine. CARFAX One-Owner. Clean CARFAX. Certified. PRISTINE CONDITION, GPS / NAVI / NAVIGATION, SUNROOF / MOONROOF / ROOF, Leather, Bluetooth Handsfree, NO ACCIDENTS ON CARFAX REPORT, TOYOTA CERTIFIED*7 YEAR/100K MILE WARRANTY*$0 DEDUCTIBLE*BUY WITH PEACE OF MIND, Rear View Camera, LEATHER, One Owner, NONSmoker, Local Trade, MUST SEE!, New Tires, Fresh Oil Change, Passed 160 Point Toyota Certified Inspection, Freshly Detailed, MINT CONDITION, EXCELLENT CONDITION, 4X4 4X4 4X4 LIMITED ALL THE EYES , THE CERTIFIED USED CARS FROM BEAVER TOYOTA THE BEST IN THE COUNTRY! !WE HAVE THE BEST AND WE SELL YOU AND YOUR FAMILY THE BEST USED CARS IN THE MARKET! !, ABS brakes, Compass, Electronic Stability Control, Front dual zone A/C, Illuminated entry, Leather Seat Trim, Low tire pressure warning, Navigation System, Power moonroof, Remote keyless entry, Traction control. White 2016 Toyota Tacoma Limited 4WD V6 Toyota Certified Used Vehicles Details: * Transferable Warranty * 160 Point Inspection * Warranty Deductible: $50 * Powertrain Limited Warranty: 84 Month/100,000 Mile (whichever comes first) from original in-service date * Roadside Assistance * Limited Comprehensive Warranty: 12 Month/12,000 Mile (whichever comes first) from certified purchase date. Roadside Assistance for 1 Year * Vehicle History Awards: * 2016 KBB.com Best Resale Value Awards * 2016 KBB.com Best Buy Awards Finalist White 2016 Beaver Toyota Tacoma Limited is a 4D Double Cab 4WD . This Florida Truck has a V6 engine. Call right now and schedule a test drive. Ask for stock number 024144, the Florida 2016 Beaver Toyota Tacoma . Shop Us Online at www.beavertoyotastaugustine.com. Serving Jacksonville, Palm Coast, Daytona, Gainesville and St Augustine. Beaver Toyota St Augustine on 2995 US Hwy 1 South in St Augustine. CARFAX One-Owner. Clean CARFAX. Certified. PRISTINE CONDITION, GPS / NAVI / NAVIGATION, Bluetooth Handsfree, NO ACCIDENTS ON CARFAX REPORT, TOYOTA CERTIFIED*7 YEAR/100K MILE WARRANTY*$0 DEDUCTIBLE*BUY WITH PEACE OF MIND, Rear View Camera, One Owner, NONSmoker, Local Trade, Towing Package, Bought here NEW!, MUST SEE!, New Tires, New Brakes, Fresh Oil Change, Passed 160 Point Toyota Certified Inspection, Passed Dealership Inspection, Freshly Detailed, MINT CONDITION, EXCELLENT CONDITION, ABSOLUTELY NEW ,LIKE EVERY USED CAR YOU SEE AND CAN BUY AT BEAVER TOYOTA ,AGAIN ,VOTED NUMBER ONE IN USED CAR SALES IN THE ENTIRE MARKET!!WHY! !WHY BUY ANYWHERE ELSE ,WHEN YOU CAN BUY THE BEST SERVICED AND TOP CERTIFIED USED CARS IN AMERICA AT BEAVER TOYOTA! !WE KEEP BEING RANKED IN THE TOP TEN BEST CERTIFED USED CARS IN THE NATION MONTH IN AND MONTH OUT! !WE ARE THE BEST OF THE BEST,OUR CARS ARE THE BEST SERVICED AND THE SAFEST CARS IN THE MARKET! !, 120V/400W Deck Mounted AC Power, ABS brakes, Color Keyed Rear Bumper, Compass, Electronic Stability Control, Engine Immobilizer, Illuminated entry, LED Daytime Running Lamps, Low tire pressure warning, Navigation System, Remote keyless entry, Smart Key w/Push Button Start, Traction control, TRD Sport Package, Wide Angle Front Fog Lamps. Silver 2018 Toyota Tacoma TRD SPORT RWD V6 Toyota Certified Used Vehicles Details: * Vehicle History * Powertrain Limited Warranty: 84 Month/100,000 Mile (whichever comes first) from original in-service date * Roadside Assistance * Warranty Deductible: $50 * Transferable Warranty * Limited Comprehensive Warranty: 12 Month/12,000 Mile (whichever comes first) from certified purchase date. 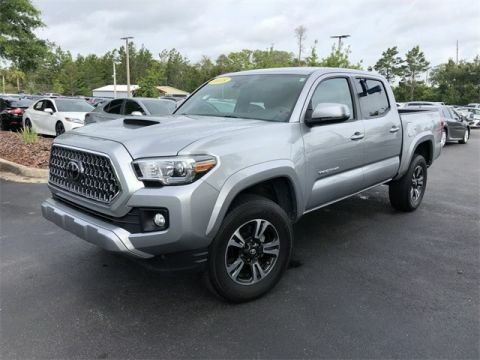 Roadside Assistance for 1 Year * 160 Point Inspection Silver 2018 Beaver Toyota Tacoma TRD SPORT is a 4D Double Cab RWD . This Florida Truck has a V6 engine. Call right now and schedule a test drive. 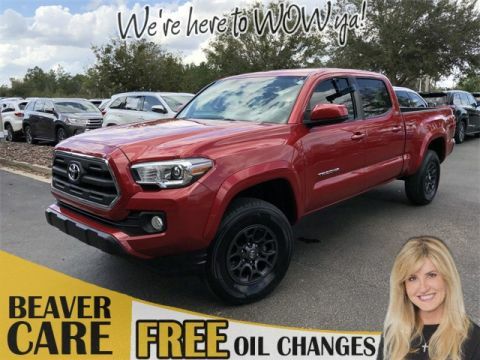 Ask for stock number M234992A, the Florida 2018 Beaver Toyota Tacoma . Shop Us Online at www.beavertoyotastaugustine.com. Serving Jacksonville, Palm Coast, Daytona, Gainesville and St Augustine. Beaver Toyota St Augustine on 2995 US Hwy 1 South in St Augustine. CARFAX One-Owner. Clean CARFAX. Certified. PRISTINE CONDITION, GPS / NAVI / NAVIGATION, Bluetooth Handsfree, NO ACCIDENTS ON CARFAX REPORT, TOYOTA CERTIFIED*7 YEAR/100K MILE WARRANTY*$0 DEDUCTIBLE*BUY WITH PEACE OF MIND, Rear View Camera, One Owner, NONSmoker, Local Trade, Towing Package, MUST SEE!, Fresh Oil Change, Passed 160 Point Toyota Certified Inspection, Passed Dealership Inspection, Freshly Detailed, MINT CONDITION, EXCELLENT CONDITION, TRD SPORT ,TOP CERTOFIED DEALER IN THE NATION ,BEST SERVICED CARS IN THE MARKET! !SAFEST IN THE MARKET ! !, 120V/400W Deck Mounted AC Power, Auto-Dimming Inside Rear-View Mirror w/Compass, Black Overfenders, Engine Immobilizer, LED Daytime Running Lamps, Power Sliding Rear Window w/Privacy Glass, Smart Key w/Push Button Start, TRD Off Road Package (OC), Variable Intermittent Wipers, Wide Angle Front Fog Lamps. Priced below KBB Fair Purchase Price! 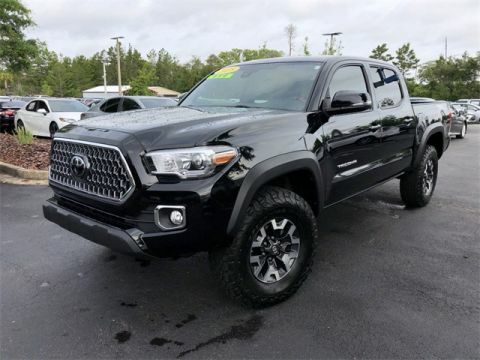 Midnight Black Metallic 2018 Toyota Tacoma TRD Offroad 4WD V6 Toyota Certified Used Vehicles Details: * Transferable Warranty * 160 Point Inspection * Limited Comprehensive Warranty: 12 Month/12,000 Mile (whichever comes first) from certified purchase date. 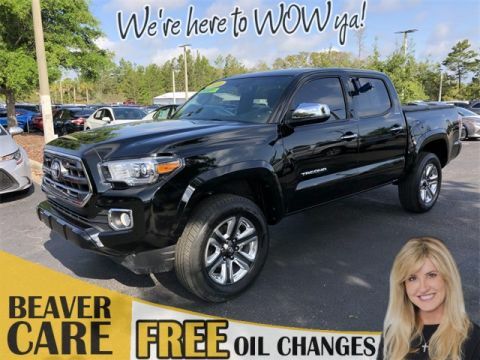 Roadside Assistance for 1 Year * Vehicle History * Warranty Deductible: $50 * Roadside Assistance * Powertrain Limited Warranty: 84 Month/100,000 Mile (whichever comes first) from original in-service date Midnight Black Metallic 2018 Beaver Toyota Tacoma TRD Offroad is a 4D Double Cab 4WD . This Florida Truck has a V6 engine. Call right now and schedule a test drive. 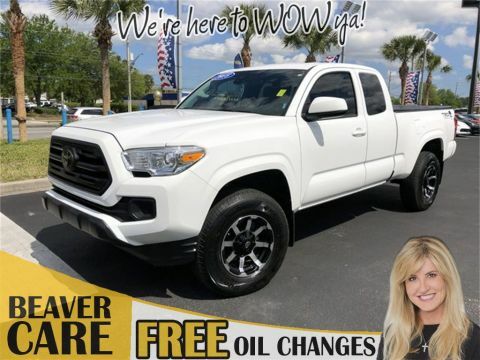 Ask for stock number 147349, the Florida 2018 Beaver Toyota Tacoma . Shop Us Online at www.beavertoyotastaugustine.com. Serving Jacksonville, Palm Coast, Daytona, Gainesville and St Augustine. Beaver Toyota St Augustine on 2995 US Hwy 1 South in St Augustine. CARFAX One-Owner. Clean CARFAX. Certified. PRISTINE CONDITION, NO ACCIDENTS ON CARFAX REPORT, TOYOTA CERTIFIED*7 YEAR/100K MILE WARRANTY*$0 DEDUCTIBLE*BUY WITH PEACE OF MIND, Rear View Camera, One Owner, NONSmoker, Local Trade, Towing Package, MUST SEE!, New Tires, Fresh Oil Change, Passed Dealership Inspection, Freshly Detailed, MINT CONDITION, EXCELLENT CONDITION, LOW MILES ,CERTIFIED FROM THE TOP TEN DEALERSHIP IN THE COUNTRY ,WE HAVE THE BEST WE SELL THE BEST! !DONT BUY FROM ANYWHERE ELSE ,BEAVER TOYOTA CARES ABOUT OUR CUSTOMERS FOR LIFE!!. Priced below KBB Fair Purchase Price! White 2018 Toyota Tacoma SR5 4WD V6 Toyota Certified Used Vehicles Details: * Transferable Warranty * Powertrain Limited Warranty: 84 Month/100,000 Mile (whichever comes first) from original in-service date * Vehicle History * 160 Point Inspection * Limited Comprehensive Warranty: 12 Month/12,000 Mile (whichever comes first) from certified purchase date. Roadside Assistance for 1 Year * Warranty Deductible: $50 * Roadside Assistance White 2018 Beaver Toyota Tacoma SR5 is a 4D Double Cab 4WD . This Florida Truck has a V6 engine. Call right now and schedule a test drive. 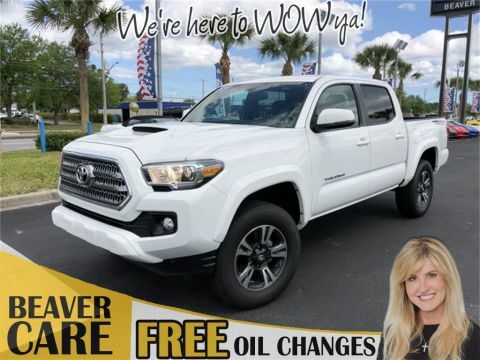 Ask for stock number 310765B, the Florida 2018 Beaver Toyota Tacoma . Shop Us Online at www.beavertoyotastaugustine.com. Serving Jacksonville, Palm Coast, Daytona, Gainesville and St Augustine. Beaver Toyota St Augustine on 2995 US Hwy 1 South in St Augustine. CARFAX One-Owner. Clean CARFAX. Certified. ABS brakes, Active Cruise Control, Air Conditioning, Alloy wheels, Compass, Electronic Stability Control, Illuminated entry, Low tire pressure warning, Remote keyless entry, Traction control. Priced below KBB Fair Purchase Price! Grey 2018 Toyota Tacoma TRD Sport 4WD V6 Toyota Certified Used Vehicles Details: * Warranty Deductible: $50 * Vehicle History * Powertrain Limited Warranty: 84 Month/100,000 Mile (whichever comes first) from original in-service date * Roadside Assistance * Transferable Warranty * 160 Point Inspection * Limited Comprehensive Warranty: 12 Month/12,000 Mile (whichever comes first) from certified purchase date. Roadside Assistance for 1 Year Grey 2018 Beaver Toyota Tacoma TRD Sport is a 4D Double Cab 4WD . This Florida Truck has a V6 engine. Call right now and schedule a test drive. 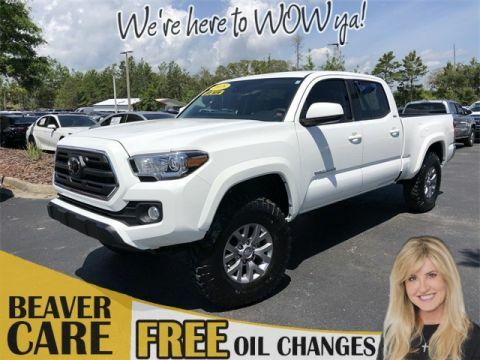 Ask for stock number M224479A, the Florida 2018 Beaver Toyota Tacoma . Shop Us Online at www.beavertoyotastaugustine.com. Serving Jacksonville, Palm Coast, Daytona, Gainesville and St Augustine. Beaver Toyota St Augustine on 2995 US Hwy 1 South in St Augustine. CARFAX One-Owner. Clean CARFAX. Certified. ABS brakes, Compass, Electronic Stability Control, Front dual zone A/C, Illuminated entry, Leather Seat Trim, Low tire pressure warning, Navigation System, Power moonroof, Remote keyless entry, Traction control. Black 2016 Toyota Tacoma Limited RWD V6 Toyota Certified Used Vehicles Details: * Transferable Warranty * 160 Point Inspection * Vehicle History * Roadside Assistance * Limited Comprehensive Warranty: 12 Month/12,000 Mile (whichever comes first) from certified purchase date. Roadside Assistance for 1 Year * Warranty Deductible: $50 * Powertrain Limited Warranty: 84 Month/100,000 Mile (whichever comes first) from original in-service date Awards: * 2016 KBB.com Best Buy Awards Finalist * 2016 KBB.com Best Resale Value Awards Black 2016 Beaver Toyota Tacoma Limited is a 4D Double Cab RWD . This Florida Truck has a V6 engine. Call right now and schedule a test drive. Ask for stock number M095024A, the Florida 2016 Beaver Toyota Tacoma . Shop Us Online at www.beavertoyotastaugustine.com. Serving Jacksonville, Palm Coast, Daytona, Gainesville and St Augustine. Beaver Toyota St Augustine on 2995 US Hwy 1 South in St Augustine. CARFAX One-Owner. Clean CARFAX. PRISTINE CONDITION, GPS / NAVI / NAVIGATION, Bluetooth Handsfree, NO ACCIDENTS ON CARFAX REPORT, TOYOTA CERTIFIED*7 YEAR/100K MILE WARRANTY*$0 DEDUCTIBLE*BUY WITH PEACE OF MIND, Rear View Camera, One Owner, NONSmoker, Local Trade, MUST SEE!, Fresh Oil Change, Passed 160 Point Toyota Certified Inspection, Passed Dealership Inspection, Freshly Detailed, MINT CONDITION, EXCELLENT CONDITION. Cement 2018 Toyota Tacoma TRD Sport 4WD V6 Cement 2018 Beaver Toyota Tacoma TRD Sport is a 4D Double Cab 4WD . This Florida Truck has a V6 engine. Call right now and schedule a test drive. 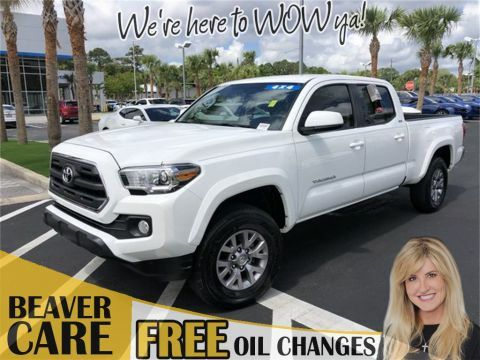 Ask for stock number 050992, the Florida 2018 Beaver Toyota Tacoma . Shop Us Online at www.beavertoyotastaugustine.com. Serving Jacksonville, Palm Coast, Daytona, Gainesville and St Augustine. Beaver Toyota St Augustine on 2995 US Hwy 1 South in St Augustine. Clean CARFAX. Certified. PRISTINE CONDITION, GPS / NAVI / NAVIGATION, Bluetooth Handsfree, NO ACCIDENTS ON CARFAX REPORT, Rear View Camera, One Owner, NONSmoker, Local Trade, Towing Package, MUST SEE!, Fresh Oil Change, Passed 160 Point Toyota Certified Inspection, Passed Dealership Inspection, Freshly Detailed, MINT CONDITION, EXCELLENT CONDITION, ABS brakes, Active Cruise Control, Air Conditioning, Alloy wheels, Compass, Electronic Stability Control, Illuminated entry, Low tire pressure warning, Navigation System, Remote keyless entry, Traction control. Silver Sky Metallic 2018 Toyota Tacoma TRD Offroad 4WD V6 Toyota Certified Used Vehicles Details: * 160 Point Inspection * Roadside Assistance * Limited Comprehensive Warranty: 12 Month/12,000 Mile (whichever comes first) from certified purchase date. Roadside Assistance for 1 Year * Warranty Deductible: $50 * Transferable Warranty * Vehicle History * Powertrain Limited Warranty: 84 Month/100,000 Mile (whichever comes first) from original in-service date Silver Sky Metallic 2018 Beaver Toyota Tacoma TRD Offroad is a 4D Double Cab 4WD . This Florida Truck has a V6 engine. Call right now and schedule a test drive. 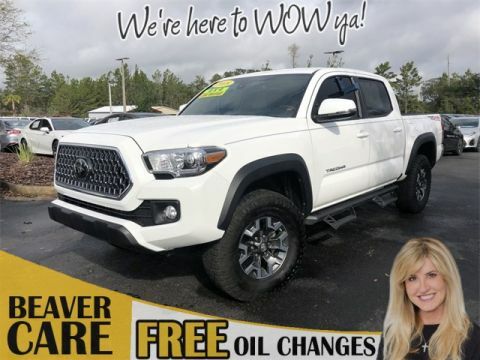 Ask for stock number 004339A, the Florida 2018 Beaver Toyota Tacoma . Shop Us Online at www.beavertoyotastaugustine.com. Serving Jacksonville, Palm Coast, Daytona, Gainesville and St Augustine. Beaver Toyota St Augustine on 2995 US Hwy 1 South in St Augustine. The Tacoma is a popular pickup for buyers and critics alike. U.S. News and World Report even selected the used Toyota Tacoma as one of the 20 best used compact trucks under $20,000 from U.S. News and World Report. 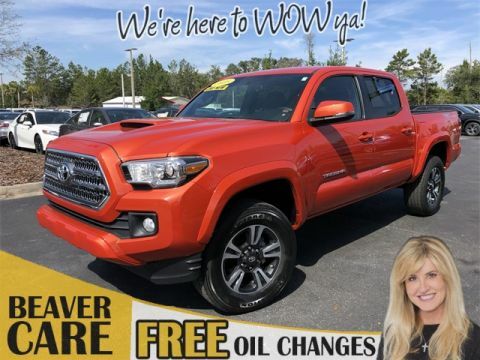 It can be found in the Tacoma TRD Off-Road trim level which includes off-road wheels, shocks, and other features designed to handle Jacksonville off-road trails. Whether you’re in the market for a double cab or a crew cab configuration, turn to Beaver Toyota St. Augustine. Explore our range of vehicles under 10k if you’re looking for a great bargain! And for more off-road options, we carry a range of used Jeeps at our St. Augustine showroom.